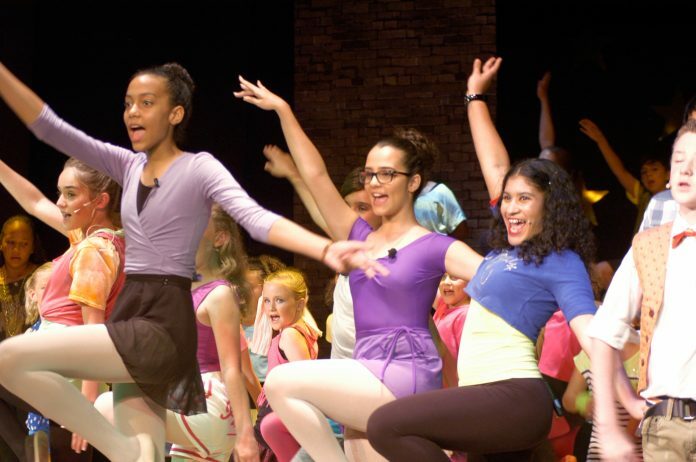 Life imitates art in “Fame the Musical Jr.,” currently showing at the Prospect Playhouse theatre. The plot centers on a group of plucky kids learning their craft at a performing arts school and is staged by a group of plucky kids also learning their craft at a performing arts school. For all the genius typecasting, the show about children and for children was an ambitious undertaking. 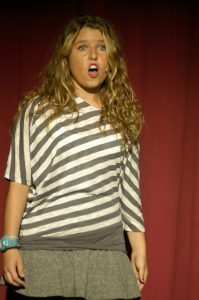 With fledgling actors, several of whom hadn’t performed publicly before, and a large young cast, staging “Fame the Musical Jr.” was certainly something of a gamble. “Only when we moved to the Prospect Playhouse for rehearsals did they all come together,” she added. From left, Ellie Nickason, Natalie Galloway, Jessica Bridges, McKenna Knapik and Julianna Gaspar. It’s always hard reviewing children’s productions, especially those where so many of the cast are green. However, the extreme youth of many of the performers, ranging in age from 6 to 15 years old (who sang and danced as if future equity cards depended on it) and the audience awash with adoring relatives (who clapped and laughed uproariously in all the right places) gave the whole evening a warm and fuzzy feel. As the show progressed, nerves were conquered, minor technical gremlins were resolved and the key players inhabited their characters. It was a lively show with some well-executed dance numbers involving the full cast. 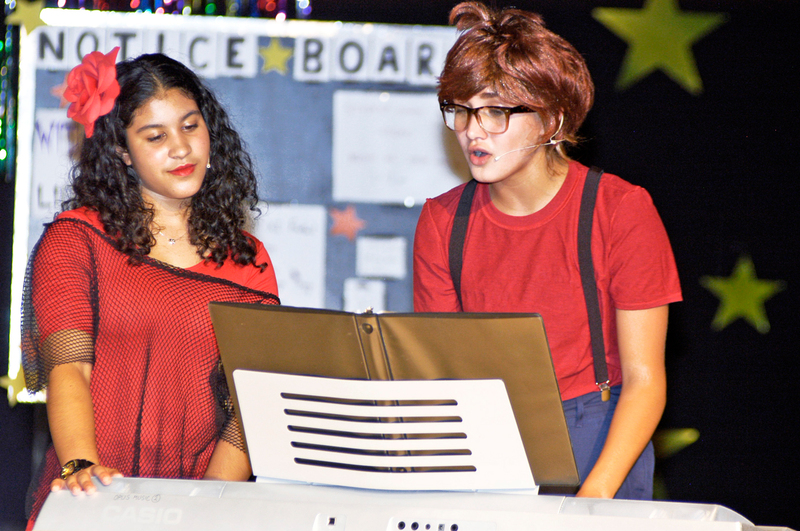 The chorus of more than 30 youngsters was energetic and engaging, adding plenty of color and extra pizazz to the plot, while showing off growing acting, dancing and musical performance skills. The company’s senior actors took on the meatier speaking roles, with the show being carried along by the enthusiasm of the chorus and the exuberance of the cast in general. Carmen, played by Hannah Foster, and Schlomo, played by Mikayla Corin – two strong performers. The standout acting performance of the night came from Hannah Foster, 13, who played the talented and driven dancer Carmen Diaz. Hungry for fame and single-minded in her focus to achieve it, the actress in her first role as lead character portrayed a maturity beyond her years, turning in a vibrant and nuanced performance. As well as strong acting chops, her singing voice enthralled. Plaudits too should go to Mikayla Corin, who delivered a sensitive and convincing performance as Carmen’s would-be love interest and shy guy, Schlomo Metzenbaum. Other creditable performances were given by the male lead Oliver Bishop, who played classics actor Nick Piazza. Mya Heiss as Serena Katz conveyed the teenage angst of first love well and had a wonderful singing voice which echoed that. has an impressive singing voice. For comic timing and a delightful singing voice, Sophie Sherlock as Mabel Washington proved another crowd-pleaser. Katherine Walmsley, as the strict but student-loving Greta Bell and her counterpart Ellie Stabler as Miss Sherman, who like the tank of the same name is a rather forceful and unbending character, also caught the audience’s attention whenever on stage. Most of the former could draw on the experience gained in the company’s earlier productions including “Shrek” (2015), “Beauty and the Beast” (2014) and “The Little Mermaid” (2013), showing that hard work and artistic passion usually pays off in the end. Tickets are $30 for adults and $20 for children. Visit www.musicians.ky and click the Fame button.